Since man began telling stories, horror has existed. It taps into something primal; life and, particularly, death issues. In many ways it is the purest from of cinema - your reaction isn't emotional or intellectual but physical, a knee-jerk jolt of fear, revulsion or relief. And so movies have mapped it's shadowy corridors, it's bloody chambers and, in more recent times, it's high schools and teen bedrooms. Moviemakers have been enticed by the genre, it allows them to express strong themes and indulge in shocking visuals: from the stark brilliance of Nosferatu to the glowing melodrama of the Universal classics (Dracula, Frankenstein et al) through the camp vigour of Hammer to the rough and ready American indies (Night of the Living Dead). Slasher movies (A Nightmare on Elm Street) dismembered the teen movie, while recently the genre has taken inspired diversions into satirical, self-referential side streets (Scream, Fight Club). In this, the second in our ongoing celebration of movie genres, Empire has probed, autosied cunjured up and brought back from the dead the 50 greatest horror movies ever. The classics are given a new lease of life, modern greats are granted due credit and some shad crations are brought screaming into the daylighght. Plus, there's a smattering of controversial entries thrown in to get you thinking. The idea is to invent or, indeed, reinvent some great, great movies for you. We wish you many sleepless nights. There are some horror films in which the supermatural is more elusive but their depiction of stranger, darker places they cannot escape the clutches of the genre. Nightmare Movies hint at innocent corrupted, minds framenting and the deep perversion of humanity, from the prevading evil and looming tragedy of Don't Look Now to the bleak cruelty of Witchfinder General, to the cannibal craziness of The Hills Have Eyese. Videodrome focused its surreal horror on the emergent video culture of the '80s, while The Blair Witch Project, a raw and terrifying antidote to slick Hollywood shockers, proved itself a horror movie for the ne millenium. The existence of ghosts, restless spirits of the undead, has long troubled scientists and excited storytellers. Traditionally, the unsettled dead are a territorial bunch, confining their hauntings to castle ramparts and old dark houses. On celluloid th've been given a free rein. The best movie ghost sotries are sophisticated psychological chillers. The Haunting and The Sixth Sense subtly probe the human experience, while Poltergeist adopts a more fullon terror campaign. Candyman, one of the most original ghost stories ever brought to the screen, is a truly weird, class-related tale of revenge from beyond the grave. Ever since Hitchock consigned Janet Leigh to the plughole of history in Psycho, no self-respecting studio has let a year go by without a slasher movie on its roster. Deom gleefully wanton, supernatural incarnations such as dreamstalker Freddy Krueger in A Nightmare on Elm Street, to the all-too real Henry in John McNaughton's documentry styled portrait of his eponymous serial killer, the blood has flowed with unnerving refularity. Nevertheless, it is a seminal, contrasting pair that is still way ahead of the pack: Hitch's brilliant, darkly comic masterpiece and John Carpenter's Halloween, the indelible blueprint for the modern slasher flick. For all the evil that men do, there is still nobody who does it better than the main man, the guv'nor, tha baddest boy on the block: Satan. And his malevolent meddlings in the affairs of men have long provided rich pickings for the filmmaker's febrile mind. The Omen fabrivated a Biblical basis for the arrival of the Antichrist, the taut paranoia of Rosemary's Baby traced a similar course for the demon seed, whilse Hellraiser took a fantastical jaunt to a hideous, gory vision of Hell itself. But the big kahuna of Diabolical movies surely remains William Friedkin's head=spinning, pea soup-spewing masterpiece, The Exorcist. Hallelujah, indeed. Nightmares in damaged brains? Truth, or the wild rantings of a disintegrating mind? Psychological horror treads a disturbing path through the cerebral synapses, leading us down twisting paths of tortured thoughts to murder, mayhem and madness. Be it the evil possession of men, from the Overlook Hotel's dark hold on the shattered Jack Torrance in The Shining or the whirling, kinetic charge of Evil Dead 2. Be it Carrie's pubescent, telekenetic powers; the mind games locked deep within The Cabinet of Dr. Caligari, or the corrosive social atire of Fight Club, head trips are rarely more intense. Let the ride begin. 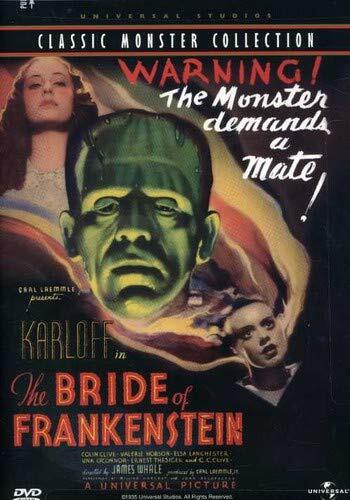 Additional Information: Frankenstein is the single most important horror film ever made. Universal's Dracula (1931_, to which Whale's film was a follow-up, was a spooky adaptation of a Broadway play. It could easily have been a one-off, remembered only as a footnote to the drawing-room mystery. Without Frankenstein, there wouldn't be a genre called the horror film, and the form would never have found it's greatest star. The English Whale took the project, which had been prepped to director-writer Robert Florey as a possible vehicle for Dracula star Bela Lugosi, to escape being typecast as a director of World War I-themed movies like Hell's Angels (1930) and Journey's End (1930). Later, after The Invisible Man (1922) and Bride of Frankenstein (1935), he regretted even more his close identification with a genre that swiftly became the most d�class� in Hollywood. But while he was putting the picture together, he exercised all his peculiar creativity, hacking out of Mary Shelley's unwiedling novel a fable of an overreaching scientist and his abused, childlike outcast of a monster. For the role of Henry Frankenstein (as opposed to Shelley's Victor), Whale rejected Leslie Howard and cast his neurotic Journey's End leading man Colin Clive, whose clipped British vowels sound strange in the supposedly mid-European setting (the film seems to be set in a light opera-style no-place, no-time rather than a real county). From the cast of Dracula. Wahle retained both Edward Van Sloan as the sceptical elder who strongly disapproves of Frankenstein's experiments, and the unforgettable Dwight Frye as the hunchbacked dwarf assistant who drops the normal brain he has been told to steal and substitutes that a mad criminal. However, the career break-out of the film was William Henry Pratt, a 42 year-old Englishman who had turned his back on a privileged upbringing and emigrated to become a truck driver in Canada and a jobbing bit-player in the States. Pratt had popped up in a few gangster and melodrama movies, but Whale saw something in his eyes that fitted hi conception of the Monster. Universal's make-up genius Jack P. Pierce devised the flattop, the neck terminals (not bolts), the heavy eyelids and the elongated, scarred hands. Meanwhile Whale kitted the creature out with a shabby suit like those worn by the ex-soldier hobos then riding the rails, and added the clumping asphalt-spreader's boots. But it was Pratt who transformed the Monster from a snarling bogeyman into a yearning, sympathetic character whose misdeeds are accidental (drowning the girl) or justified (hanging the dwarf who has tortured him with fire). In the opening credits, the Monster is billed as being played by "?". Only at the end of the film were the audience told it was a fellow by the name of Boris Karloff, Pratt's stage hangle, who had terrified, moved and inspired them. The pain in Karloff's eyes is real - all the clobber was agony to wear, and the experience turned the mild-mannered actor into a militant: he helped found the Screen Actors Guild to save others from suffering for long hours under the California sun and the burning arc-lights. Modern audiences find some of the plot scenes trite and chatty, with winsome heroine Mae Clarke and stiff second lead John Boles tiresome unless the Monster is threatening them. But all of Karloff's scenes - and most of Clive's and Frye's grave-robbing - remain as compelling as ever. There are a number of wondrous theatrical set-pieces, among them the "creation", with lightning crackling around the tower and the Monster raised to the angry sky on an operating table; the Monster's first appearance (seen from behind, he turns to show us his face and the camera stutters towards him); the heart-breaking sequence with the little girl; the primal attack on the heroine on her wedding day (one of the few bits taken from the book); and the pursuit of the Monster by a mob of peasants, winding up in the old mill where creator and creation confront each other in one of the earliest horror movie inferno finales. 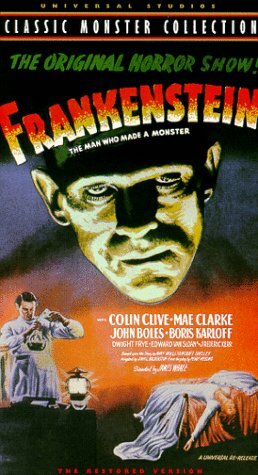 Originally, Clive died and Clarke paired off with Boles, but post-production tinkering saved Frankenstein for the sequels. Whale, Karloff and Clive were persuaded to come back in 1935 for Bride of Frankenstein, a sequel that is more elaborate, sophisticated, cynical and entertaining than the original, if also a trifle more calculated in its sentiment and misanthropy. Oddly, Whale again tried to kill Frankenstein and again changed his mind at the last minute. Whale quit, but Karloff became the grand old man of horror. He had another spin in his best role in the spirited Son of Frankenstein (1939), then made way for lesser horror stars Lon Chaney Jr. (Ghost of Frankenstein (1941)) and sadly, Lugosi (Frankenstein Meets The Wolf Man (1943) before stunt man Glenn Strange got into the boots for House of Frankenstein (1944) - in which Karloff plays a mad doctor - House of Dracula (1945) and the death knell wind-up Abbott and Costello Meet Frankenstein (1948). The Universal cycle runs the entire gamut from perfection through pastiche and pulp to parody. But Frankenstein remains chilly and invigorating, the cornerstone of its entire genre. Additional Information: Eine Symphonie Des Grauens - A Symphony Of Horrors. They don't write movie sell-lines like that any more, and they certainly don't make movies like this faded, haunting masterpiece of silent cinema any more either. In 1921, director F. W. Murnau founded the company Praha-Film with a view to producing a series of occult films. Murnau was a better director than he was a businessman however, and the only film released by Praha before it went bust was Nosferatu. Originally Murnau had planned a straightforward adaptation of Bram Stoker's Dracula, but was prevented by Stoker's estate from obtaining the rights. Unperturbed, and rather naively it must be said, he attempted to circumvent the ruling by changing the names of the principal characters and re-jigging certain plot points and settings - Dracula became Count Orlok, Jonathan Harker became Hunter and Van Helsing became Professor Bulwer; Orlok stalks the gothic streets of Bremen rather than Victorian London. Confusingly, in later points of the film where the original titles cards have been translated, the character's names appear as their Stoker counterparts. Still, Murnau's ploy fooled no one, least of all Stoker's widow who, impoverished by her husband's death and entirely dependent on revenue from his work, sued Praha for copyright infringement. Unluckily for her, by the time the British Society Of Authors had filed suit on her behalf, Murnau's reckless spending, much of it on publicity for Nosferatu, had sent his fledgling studio into receivership and thus the coffers were bare. But Florence Stoker was a tenacious old bird. She pursued the case relentlessly and in Jult 1925 a German court ordered all prints of the film to be destroyed. Thankfully several negatives survived and despite Stoker's best efforts to impede its wider distribution (she did prevent the London premiere in 1925_, her cause was finally lost when the film reached America in 1929. Although met with a respectable response from both public and critics on its release, Nosferatu was not widely acclaimed until well after World War II. Even then its rediscovery cane after the belated critical praise heaped on Murnau's more accessible works, particularly Sunrise (1927). By then, of course, surviving prints of the film were in parlous state and it's now almost impossible to gauge how it would have looked to a contemporary audience. 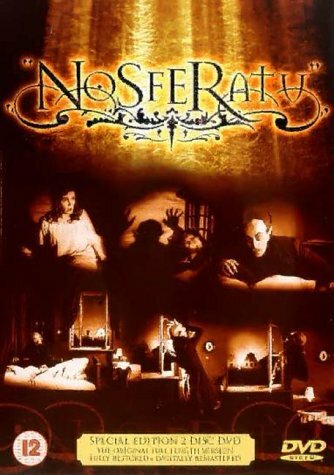 Not an unusual state of affairs by any means, but, strangely, Nosferatu has suffered less from the ravafes of time than most films of its age. Its opaque, ghostly appearance enhances its dream-like quality and the themes of corruption and decay are mirrored in the decomposing stock itself. Seredipitous disintegration aside, Nosfeartu remains a fascinating relic and one that can still raise a shiver even 80 years after it was mad. Murnau was a disciple of flamboyant theatrical legend Max Reinhardt, and learnt much about set design and composition from the master. He was also influenced to a degree by the Expressionist movement (scriptwriter Henrik Galeen had worked on seminal Expressionist films The Cabinet of Dr. Caligari (1919) and Der Golem (1919), but it is a common mistake to label Nosferatu a work of pure Expressionalism; Murnau's aesthetic was far more complex than that. To begin with, he took the unprecedented step of shooting most of the film on location and, in essence, it's the juxtaposition of realism and Expressionism (most evident in the interiors of Orlok's castle) that give the film its hypnotic visual power. Murnau's experiences as a fighter pilot during World War I also had a profound effect on his technique as a film director. Throughout his career he strove to give the camera movement, allowing it to glide unhampered through scenes, like a plane travelling in three dimensions through the landscape rather than to record the action from a fixed position. Primitive, unwieldy equipment confounded his grandest ambitions, but even so there is an implication in Nosferatue that untold horrors lurk beyond the focus of the camera. Elsewhere, Murnau employs techniques like stop motion, fast motion, sophisticated cross-cutting and, in one truly arresting scene, Hutter's spectral carriage ride to Orlok's lair, negative imaging to orchestrate his macabre symphony. His insertion of documentary footage and written material - jounals, log books, and newspaper cuttings - was revolutionary for a silent film and echoes of it can be seen in Bunuel's L'Age d'Or (1930). Although the plot is broadly based Dracula, in one respect at least La Stoker's case seems to have been built on somewhat shaky ground. Count Orlok bears as much relation to the seductive charismatic aristocrat of her Huband's novel as the Wolf Man does to Deputy Dawg. In the title role Max Schreck, an obscure character actor whose surname means "fright" in German, cuts a genuinely repulsive figure. With skeletal features, deathly pallor and talon-like fingernails he is the antithesis of the vampire as sensual sexual predator. He moves in staccato, jerky movements, quick and furtive like a rodent. The name Nosferatu comes from the old Slavic word for "plague bringer" and tumbling hordes of rats follow in his wake. Schreck contributes an extraordinary performance. He never fully escaped from Orlok's shadow and audiences found him so chillingly realistic, rumours circulated that he was, in fact, a real vampire. Sadly he wasn't. He was as human as Murnau who, after relocating to Hollywood, perished in a car crash at the age of 43. "Men must die. Nosferatu does not die!" proclaimed the original publicity for the film. We can only hope it's the truth. Additional Information: There have been many Draculas. But the one against which all others are measured is Bela Lugosi. Tod Browning's 1931 film is stagey and creaky, but it also has wonderful, unforgettable moments. Lugosi's performance is, on one level, high camp. Yet when he says "I am Dracula" by God he means it. When we're talking about the blood-sucking undead, he simply is the man. Stoker's Novel, published in 1897, has proved as irresistable for dramatisation as his campire's magnetic power over his victims. Stoker himself (business manager of London's Lyceum Thearte) turned it into a play which was never produced. Then in 1921 a Hungarian silent film, Drakula's Death (now lost), used a different plot entirely but borrowed the name. F. W. Murnau's Nosferatu is the eeriest version of all and bequeathed Max Schrek's repulsive, ratlike vampire to our collective nightmares. In 1924 in London, Hamilton Deane wrote an authorised stage version of the book which pared down both plot and characters. It was critically derided but was nevertheless a hit. And it's to this version that we owe the image of the campire as a sauve man-about-town decked in immaculate evening dress. When it reached Broadway in1927, re-written by John Balderston , it provided the big break for Hungarian emig� Bela Blasko. Bela's exotic accent and sinister charisma regularly had women fainting in the aisles. Universal's plans for a faithful adaptation of Stoker's novel were abandoned in favour of the simplified play when the Great Depression left them strapped for cash. They were also strapped for a star. It was intended as a vehicle for Lon Chaney by his favourite director, Browning, whose flair for the macabre had been amply demonstrated in the Chaney - starring London After Midnight (1927). Sadly, Chaney died of cancer in 1930. Enter Lugosi. Ill at ease with sound, Browning often deferred to cinematographer Karl Freund, whose credits included Fitz Lang's Metropolis (1927) (he would go on to direct The Mummy in 1932). Nevertheless, Browning achieved a pervasively creepy atmosphere with long periods of silence and stylised movement, massive, decayed staircases, dank dungeons, giant spider webs, squeking bats, howling wolves, and Lugosi's tortured delivery ("Listen to them, children of the night. What music they make"). Estate agent Renfield (a spledidly nutty Dwight Frye) travels to the Carpatian mountains and is met by a mysterious coachman (Lugosi) who delivers him to Castle Dracula for the worst night in history of the tourist trade. Enslaved by hus host, he arranges passage to England for a few boxes of Transylvanian soil aboard the SS Vesta, which arrives in Whitby harbour minus crew, her lifeless skipper lashed to the helm (a remarkable effective scene using discovery and reaction voices over a frozen silhouette of the dead seaman). The raving, bug-eating Renfield is taken to Dr. Seward's sanitarium and the count takes up residence in Carfax Abbey. An elegantly weird mystery man, he introduces himself to Seward, his daughter Mina (Chandler), her fianc� Harker (Manners) and her friend Lucy, luring them into a supernatural blood-letting ordeal (powerfully suggested without showing any gore save Renfield's cut finger). Enter Professor Van Helsing (Van Sloan, another veteran of the Broadway play), to unmask him and introduce the folkloric campire hunting paraphernalia of crosses, wolfsbane, stakes and sunlight. That it is Lugosi's presence that makes this film a classic is easy to demonstrate thanks to the early sound era practice of making different language versions of the same movie. Using the same script and sets, Universal produced Spanish-speaking Dracula simultaneously, its cast and crew working through the night to make way for Browning's unit by day. In many ways it is technically superior, with more interesting fluid camera work. 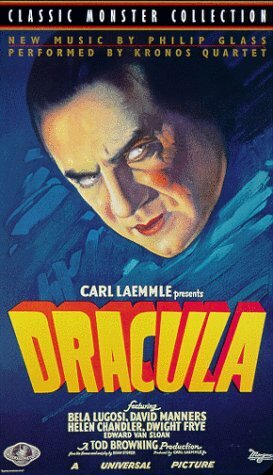 But its Dracula, Carlos Villarias, is as hokey as Lugosi but signally fails to create the deliciously tingling unease. Lugosi's unnaturalness is strangely perfect. He sported no fangs. He had no special effects make-up other than dark lipstick and light green greasepaint. Pencil spotlights were shone on his eyes to emphasise his hypnotic stare. Later Draculas have always been determinedly un-Lugosi-like: tall, smooth Christopher Lee in Hammer's handsome cycle, Jack Palance's twisted victim figure, Frank Langella's rakish seducer, tortured Gary Oldman in Coppola's spectacal, Klaus Kinski sensationally digusting in Herzog's remake of Nosferatu (1979). But from the Universal horror cycle through scores of derivative B-movies, parodies, remakes and spinoffs (including Sesame Sreet's numerate instructor The Count), it is the image of Lugosi that endures as the iconic vampire. So inseperable did he become from the role of Dracula that he ended up parodying the role in ever more degrading vehicles, the last and lowest being Ed Wood's notorious Plan 9 From Outer Space (1956). When Bela Lugosi died he was buried wearing on of his original silk capes. Forever cloaked, he casts his shadow still. Fresh from photgraphing The Murders In The Rue Morgue (1932), Karl Freund was asked by Universal to rework the Dracula formula in his directorial debut. Initially, he inteded to spin a yarn of longevity and black magic entitled Cagliostro. But Nina Wilcox Putnam's muddled story was completly revamped by John L. Balderston, another debutante who earned a reputation for adapting literary horror for the stage. Balderston had been a reporter on Howard Carter's expedition to the Valley Of The Kings, which had just concluded its decade-long excavation. However, King Tut wasn't the only inspiration for the screenplay. Elements of Dracula are clearly evident in the determination of an undead monster to possess the soul of an English rose, while Balderston's simultaneous involement in a treatment of H. Rider Haggard's novel She also coloured his thinking. Indeed, the whole enterprise had something of a rehashed feel about it. Sets and props were recycled from Dracula, while David Manners was hired to reprise the part of the anguished beau and Edward Van Sloan was cast as a Van Helsing-style troubleshooter. Evn Jack Pierce was summoned to provide Boris Karloff with makeup to match that of Frankenstein. Billed as Karloff with makeup to match that of Frankenstein. 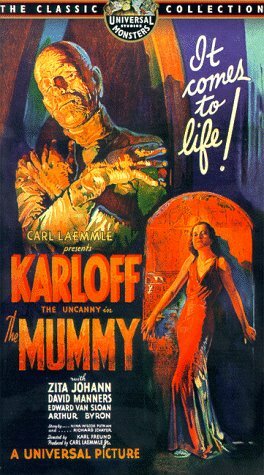 Billed as Karloff The Uncanny, the genial Englishman (born William Pratt) plays Imhotep, an ambitious high priest who is buried alive for stealing the Scroll of Thoth in a bid to resurrect his royal lover, Anckesenamon. Aomw 3,700 years later, a British expedition unearths his tomb and a young archaeologist named Norton (Bramwell Fletcher) translates the parchment and thus revives the mummy, who promptly departs in search of his beloved. Ten years pass and Imhotep is now posing as an Egyptologist who is intent on ravishing Helen Grosvenor (Zita Johann), whom he has learned is the reincarnation of his princess. However, before he can reunite them in death, he is challenged by methodical occultist Professor Muller (Van Sloan) and the doggedly loyal Frank Whemple (Manners). Much criticism has been levelled at the film for its lack of terror. Certainly Karloff is less menacing in a suit and fez than he is swathed in dust-encrusted bandages. But with its meticulous pacing and brooding atmosphere, The Mummy is perhaps the purest hybrid of German horror film and Hollywood chiller ever made. Surviving scripts suggest that the inspired camera movements and subtle edits were Balderston's. But Freund's mark on both the look and tone of the action is indelible. As the cameraman of F. W. Murnau's The Last Laugh (1924), he had pioneered the concept of the subjective view, while his work on Paul Wegner's The Golem (1915) and Fritz Lang's Metropolis (1927) steeped him in the Expressionist tradition that dominated German filmmaking in the 1920s. What's more, he had helped introduce Expressionism to Hollywood while behind the camera on Tod Browning's Dracula (1931). The Depression was biting deep by 1932 and it's no coincidence that the shambling figures of the bread queues should have found expression in the mesmerised souls of The Mummy. But shock and social comment were not the story's prime motives. Undying love (which would inspire many a vincent price picture and Coppola's Dracula (1993) prompt Imtep's crimes in both the ancient and modern worlds. Thus, the moments of horror are muted. When Norton's incantation revives Imhotep, we see his slowly opening eyes, his arms across his chest a hand reaching for the scroll and a straggle of loose bandages as he takes his leave of the stricken archaeologist, now a raving wreck after what he has witnessed. Similarly, the flashback to Imhotep's incarceration is handled with great skjill, with Karloff's wild eyes alone conveying the horror of his embalming. indeed, as in Frankenstein (1931), Karloff's ability to communicate through his makeup is cital to establishing his character, even in human form, it's clearly pain and not invarnate evil that dictates his actions. Four indifferent Universal sequels followed before Hammer, inevitably, assumed the mantle, peaking with Blood From The Mummy's Toom in 1971. Most recently, Stephen Sommers took a highly lucrative Indiana Jones-style approach in the 1999 blockbuster The Mummy. Additional Information: After the enormous success of Frankenstein in 1931, Whale was, apparantly, oddly unwilling to add a second chapter to his tale of Promethean arrogance run amok. We have reason to thank whoever persuaded him to change his mind then, since Bride not only outstrips his original foray into horror in terms of invention and visual splendour, but stands as one of the most beguiling American films ever made. Packed with Whale's impish humour and sly subversion (both well documented in Bill Gondon's excellent 1998 biopic Gods And Monsters), it also features characterisations of a subtlety seldom, if ever, witnessed in the horror genre and a clutch of acting performances to match. The story picks up loosely where Frankenstein left off. The village mob, having seen the dreaded monster burn to death in the windmill and Frankenstein himself fakk to his doom, head back to town safe in the knowledge of a job well done, their flaming torches extinguished and pitchforks stowed ready to brandish another day. Yet one couple remain, the parents of the little girl accidently drowned by the monster in the previous film. They won't be satisfied until they see the corpse with their own eyes. Unfortunately, the creature is far from dead, a point made abundantly clear when it consigns the father to his own watery grave after he is foolish enough to venture into the gutted building. Helped from the wreckage by the unwitting mother - who thinks the outstretched hand from the rubble belongs to he husband - the monster shambles off into the forest to wreak customary havor in a fruitless search for companionship. Meanwhile, back at the castle, Henry Frankenstein (Clive - another brilliant essay in barely controlled mania) who also survived the mob's vengence, is visited by the mysterious Dr. Pretorius (Thesiger), an alchemist whose hobby is also the creation of artificial life, albeit on a much smaller scale. In one of the film's most memorable scenes he shows off his Lilliputian handiwork to an appalled Frankenstein who has vowed never to play God again. Nevertheless, Pretirius outlines his plan to create a mate for the monster and later succeeds in persuading Henry, via blackmail and kidnap, to partner him. Thus, in a perfectly realised riot of thumming generators and flailing arcs of electrical current, high up in the castle rafters, the Bride is brought to life. The film stocked with similarly arresting moments - the monster, pursued through the forest finding shelter in the house of a blind, violin-playing hermit, himself as lonely as the misbegotten creature; Pretorius encountering the monster in an abandoned crypt, offering false friendship in order to lure him back to Frankenstein's castle; the monster pleading with a reluctant Frankenstein to give life to his longed for mate. Charles D. Hall's art direction and John Mescall's glowing cinematography combine to brilliant effect, seamlessly merging surrealist fantasy with classic Hollywood gothic, garnished here and there with Expressionist flourishes. Note for instance how the forest changes from lush realism to a nightmare langscape of stunted trunks and tangled undergrowth as the monster takes flight from the huntsmen, his fear and panic mirrored in the unearthly, swirling vista around him. But it is the performances of Karloff, Lanchester and Thesiger that are the heart of the film. Karloff, here receiving above-the-title billing, discovers new heights of pathos and rage, again investing the monster with a remarkable humanity. The scene in which he rails against his repulsive appearance reflected in a lake is both touching and sad. And Lanchester, who also plays the young Mary Shelley in the film's prologue, is a worthy adversary. Her darting, angular movements reminiscent of the autmaton Maria in Fritz Lang's Metropolis are beautifully controlled and, in contrast to Karloff's hulking gait, strangely elegant. Her appearance - deathly pallid skin with streaks of white hair highlighting her mountainous bouffant - is another triumph for makeup artist Jack Pierce and an image as instantly recognisable as Karloff's monster. And the shriek of horror she emits on seeing her intended for the first time rivals Fay Wray's piercing response to King Kong as the most famous scream in cinema history. But it's Thesiger who almost walks away with the film. Manipulative, camp, with ambiguous sexuality akimbo (only the director's supremely deft touch could have got past the Hays office) and an erudite way with thinly vieled blasphemy, it's impossible not to see him as an expanded version of Whale himself. And in the end it's Whale's erudite genius that brings it all together. He sculpts every nuance of self-parody, social satire , horror, humour, wit and whimsy into a dazzling whole, keeping every one of his fantastical plates spinning until the tragic, inevitable finale. Rejected by his bride and shunned by the world, the monster brings down the laboratory, burying his bride and the evil Pretorius in the debris. "We belong dead" he moans. In the original script Henry and his young wife Elizabeth also perished but at the last moment Whale saw fit to spare them. It seems an odd about face given his take on traditional relationship throughout the film. Bride has been seen, with some justification, as a thinly veiled attack on heterosexual values. Still, in 1935, if you could get away with showing a deformed monster (the ultimate rough trade?) settling down in domestic bliss, albeit short-lived, with another man, you could afford to throw the odd diverionary sop the censor's way. because its a magazine, and as you can see by the size of each movie entry i copied the entire review. You can also see by the date of the last posts i never got very far into copying out the entire magazine. If you meant why reserve at all, phpbb has a kb size limitation which means posts can only be a certain filesize maximum and this collection, if i typed out all the text, would almost certainly be greater than it. but unfortunately, its a hell of a lot of typing.